This summer the city of Columbus will be introducing a bike share (BikeShare – CoGo) system providing easy-to-use bikes for moving around the city. It allows users to pick up a bicycle at any self-serve bike and return it to any bike station in the system’s service area (30 stations will be provided along with 300 bikes). These stations will be located throughout downtown, allowing for easy access and maximum use. The Columbus system has been designed, deployed and managed by Alta Bicycle Share who have provided solutions for 6 cities (5 US and 1 Australian). The biggest deployment can be found in the city of New York (600 stations, 10,000 bikes). 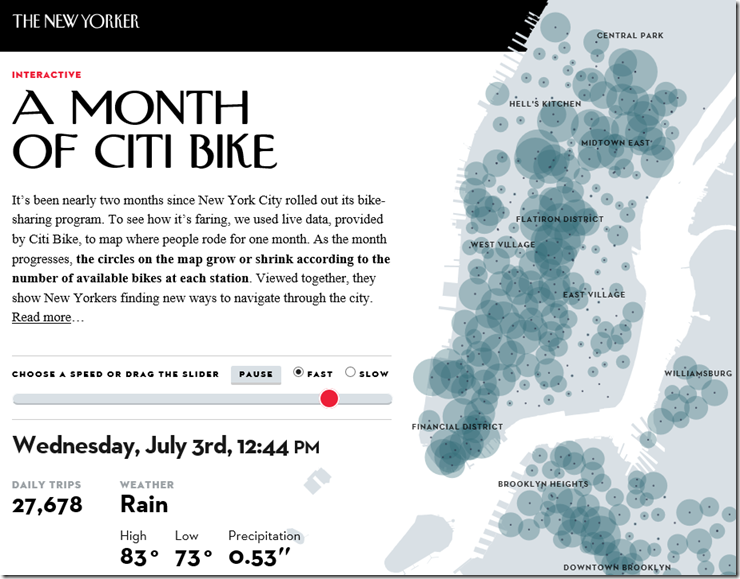 The New Yorker took the opportunity to use the data to provide a very cool interactive map of New York based on station location and bike availability. I think I want to reach out to the folks in Columbus see if I can create a mobile app that shows the availability by station and location, either way I see myself using the bike share system to explore the Scioto Mile.